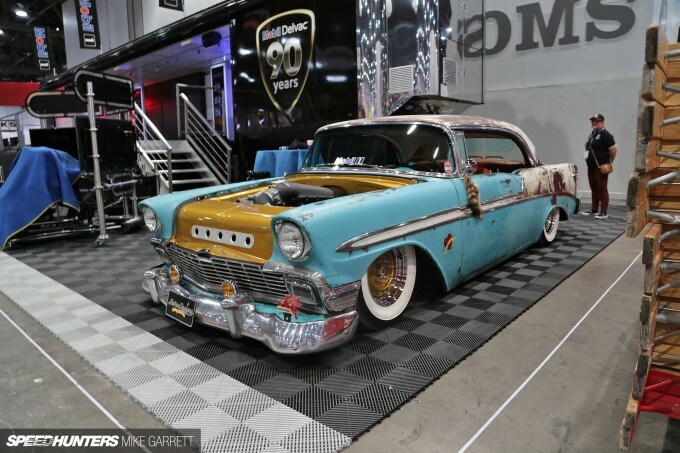 Each year at the SEMA Show, there are a number of platforms you’re guaranteed to find in large numbers. The 1960s Mustang is one, as is the first generation Camaro. Another car you can always count on seeing is the good old Tri-Five Chevy. 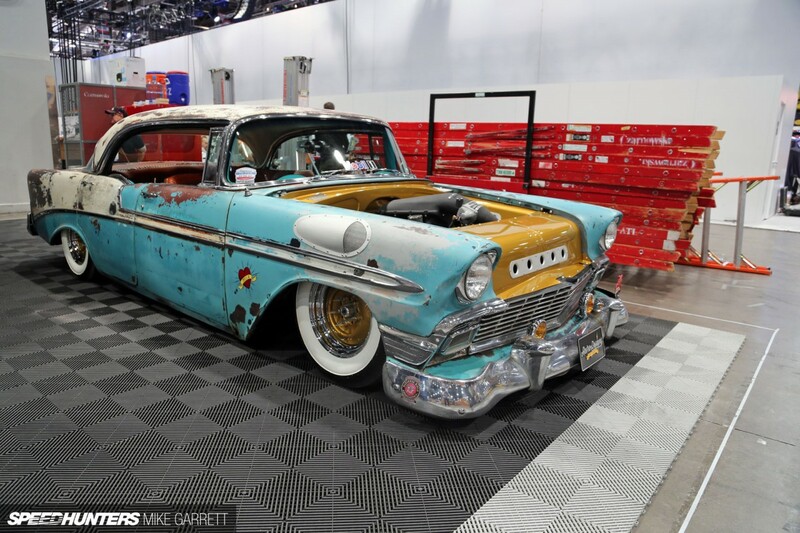 The ’55-’57 Chevy has always been one of the most popular platforms for racers and customizers, and it’s great fun to see how builders go about creating examples to stand out from the crowd. 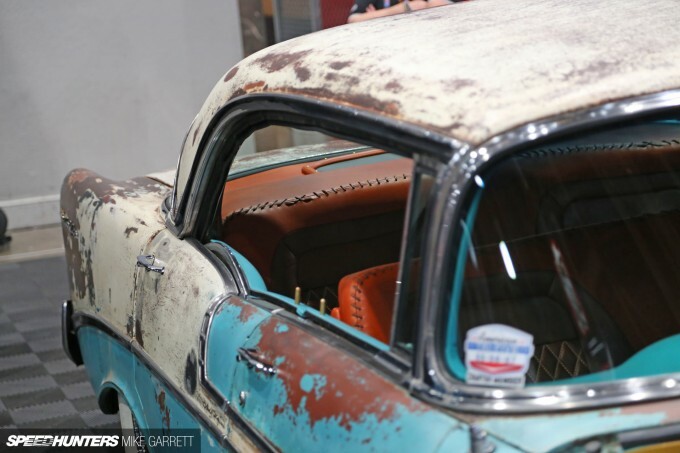 That brings me to Bela, a 1956 Chevrolet Bel Air built by Retro Designs Speed & Custom in Concord, North Carolina, and displayed in the Mobil 1 booth. One of the first things you notice about this car is that it’s built out of the four-door hardtop body style rather than the much more popular two-door. It’s unique, and it gives the ’56 a look all its own. Then there’s the body, which has the appearance of a car pulled directly from the junkyard. 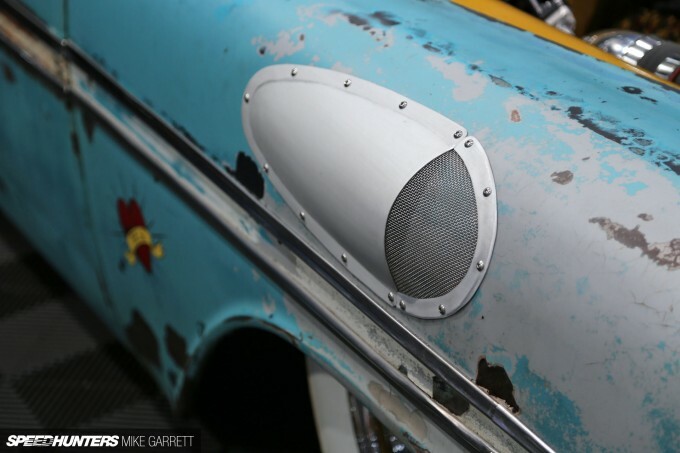 There are some other cool exterior touches as well, like leather straps over the trunk and this old school metal scoop on the passenger side fender. The scoop is functional too, helping feed air directly to the car’s Vortech-supercharged LS3 crate motor from GM Performance. In contrast to the weathered body, the engine bay is spotless, featuring a ton of custom metalwork and contrasting paint. Needless to say, the Chevy is riding on air and packing a number of parts from RideTech suspension. Rather than some sort of billet wheels, the Bel Air sits on simple wide whites with chrome-trimmed steelies hiding Wilwood disc brakes. 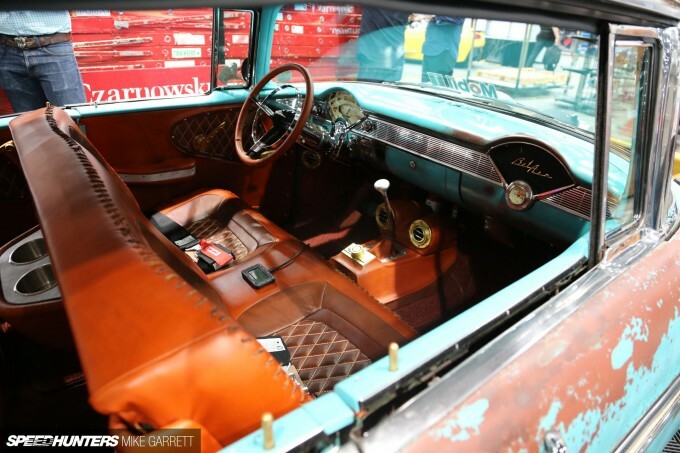 The interior shares the same attention to detail, with custom leather stitching in the style of a baseball glove and bench seating all around for maximum cruising cred’. 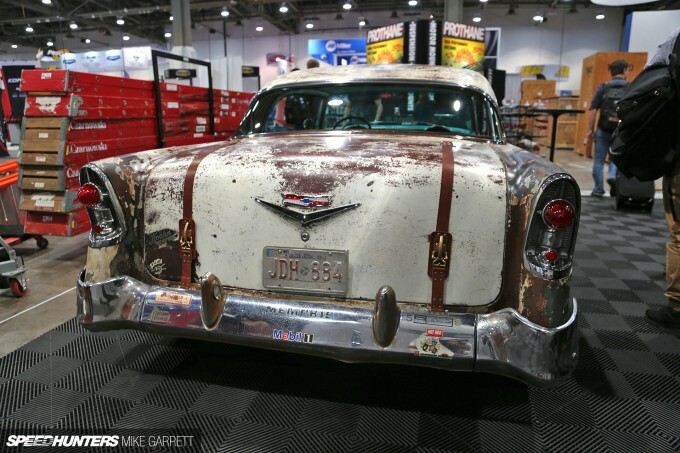 SEMA is all about creativity, and this Chevy is absolutely overflowing with it. 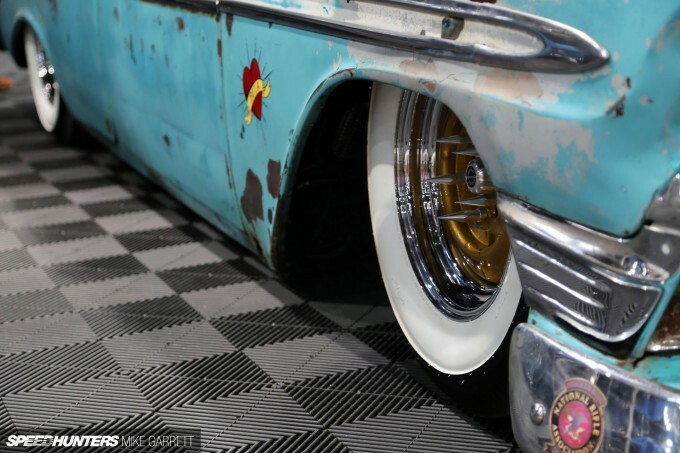 Stay tuned for more coverage and car spotlights from the floor of the Las Vegas Convention Center. Great build. Style and power. I need that COPO intake to hang on my wall! While I'm not a huge mustard yellow fan I love this. The interior is awesome and the trunk straps are a wicked touch too. For some reason I think this would feel right at home in fallout 4.
oh wow.... an old american car with an LS.... so much creativity there. (sarcasm). Those valve covers are nearly cheetah print. Coincidence? I think not. I love the car with the exception of the interior choice. I like it. I don't care for the scoop though. The whole package almost leans towards a rip off of Icon. It still neat it's a more door Which I like more than two doors. The engine is yawn but with the hood closed I wouldn't care. The wheels are predictable. But honestly the fit this car. The interior is nice though I'm not into the whole leather thing. Over I give it an eight. Loose the scoop and put the hood on it and it would fly. This thing would have looked amazing if it had a vintage-looking engine to match. I get that they wanted the engine bay to be spotless instead of patina'd, but the modern plastic and electronics really does not do it for me here. Has the bonnet been removed for the show, or is it designed to run/look like that all the time? 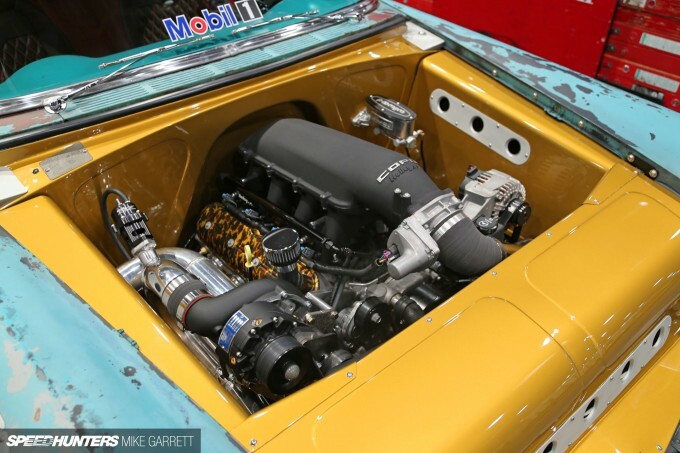 gcvphoto It's the best, most reliable, most tunable, mill that can run in a work truck, factory muscle car, drifter, drag racer, road racer, vintage engine swap, import swap...you name it the possibilities and horsepower are endless. Not to mention, they sound ALMOST better than any engine out there (Maserati V8's have my #1 vote for sound). 'Buy with one click' and the out of the box, the LS motor can compete with any mark on the planet in any forum. What's not to like?? GCV the LS as much as it is hated is really, really hard to beat reliability, price, and power. Creativity is often real expensive. For my own project I've been comparing different motor options to the LS and being 'creative' will likely ruin my budget. Obviously this car likely had a bigger budget to work with but I doubt they were lighting cigars with hundos. @fetalinjury Actually, that's verdigris, a form of patina.